I recently had the opportunity to interview Ben Powless, a young Mohawk from Six Nations in Ontario. 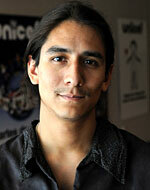 Ben is a member of the Indigenous Environmental Network and a Founder of the Canadian Youth Climate Coalition. Among other causes, he has been very active in the IEN’s tar sands campaign. He also sits on the board of the National Council for the Canadian Environmental Network, is on the Youth Advisory Group to the Canadian Commission for UNESCO, and is very involved in his local Aboriginal community. In our interview he discusses the impacts of the tar sands on indigenous communities in northern Alberta, their campaign for a moratorium on future tar sands developments and how the IEN is trying to raise awareness internationally about what is going on in Alberta. He characterizes the tar sands as a violation of the constitutionally-guaranteed rights of First Nations people in Canada.